Without question, 911 is among the most dramatic days in our history. On this ten year anniversary, most people's reactions are similarly that of pensive, respectful remembrance. Ten years ago, however, people's reactions were not all so similar. There was anger. There was fear. There was sorrow. Support. Solidarity. Patriotism. Racism. Conflict. Bravery. Sacrifice. Unity. There were cries of nonviolence met with anger and violence. Money and blood poured into the Red Cross faster than I've seen in my life. Candles were lit. Flags were displayed. Oh, the flags! It must have been a great time to be in the U.S. flag-making business. I wondered if they were all made in the U.S. They were for sale on the side of roads and in gas station shops. They were hung outside of houses and stuck to sides of cars. They were everywhere. I had a few. I found comfort in our "united we stand" philosophy just like the rest of America. It wasn't enough for me though. I tend not to think as a citizen of the United States, as much as a citizen of the Earth (or even farther, the Universe, and so on). To me, the world had taken a hit, not just the United States. It was a dark day and the world would move forward together. We are interdependent. 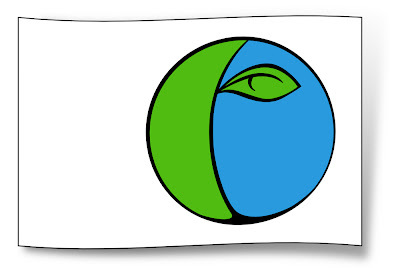 Since I am an artist and graphic designer, my reaction was to design a "world flag." At that point in time, just about everyone had an email address and there were chat groups and websites a-plenty, but there was no MySpace or Facebook ... in fact Google was a fledgling still in Yahoo's shadow. I designed the flag and began emailing and posting it around the internet, encouraging people to display it along with their country's flag (not instead of). It promoted true unity, recognizing that we are all citizens of this world who celebrate our differences while we stand together. The flag circulated and amplified in number a bit, and had some good reactions, then eventually fizzled out. Every once in a while I find my files and look at the flag that never made it to the level I envisioned. I didn't try very hard to get it to the world, after all. Maybe it was just my own personal processing of the most dramatic day in my life. I am dusting it off now, on the ten year anniversary of that day.